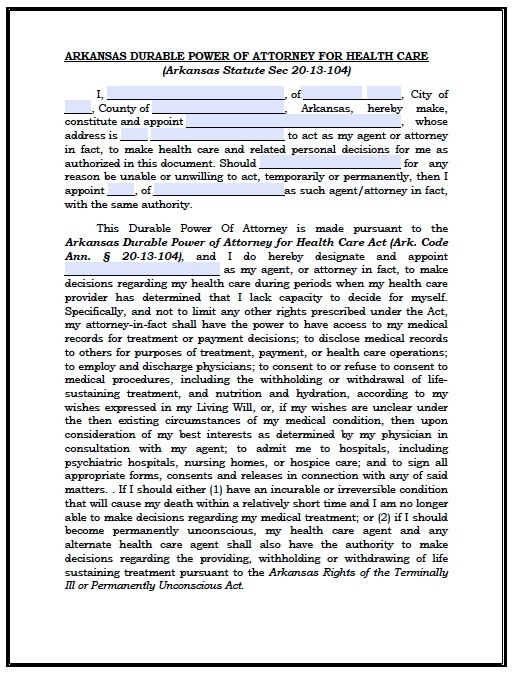 You may execute a power of attorney to authorize someone to make healthcare decisions on your behalf. This is often accompanied by a living will that specifies which types of treatments you would prefer. In Arkansas, the living will lists life-sustaining treatments that the principal can elect to receive or withhold if he or she becomes permanently unconscious and suffers from a condition that will cause death shortly. For example, the principal can choose not to receive pulmonary resuscitation, mechanical respiration, chemotherapy, or medications not needed for pain. The principal may also direct physicians to withhold either artificial hydration or nutrition in this case. For these documents to become valid, two witnesses must be present when the principal signs them. If either party would like to know more about the laws in Arkansas concerning health care powers they may do so by reading the State statutes.